From the creative team behind the bestselling, Caldecott Medal--winning Finding Winnie comes an extraordinary wartime adventure seen through the eyes of the world's most beloved bear. Here is a heartwarming imagining of the real journey undertaken by the extraordinary bear who inspired Winnie-the-Pooh. From her early days with her mama in the Canadian forest, to her remarkable travels with the Veterinary Corps across the country and overseas, and all the way to the London Zoo where she met Christopher Robin Milne and inspired the creation of the world's most famous bear, Winnie is on a great war adventure. This beautifully told story is a triumphant blending of deep research and magnificent imagination. 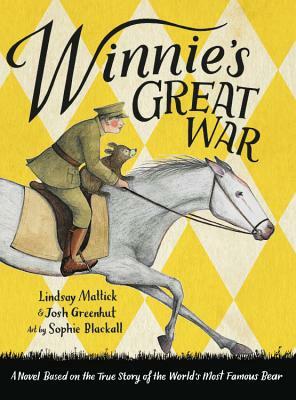 Infused with Sophie Blackall's irresistible renderings of an endearing bear, the book is also woven through with entries from Captain Harry Colebourn's real wartime diaries and contains a selection of artifacts from the Colebourn Family Archives. The result is a one-of-a-kind exploration into the realities of war, the meaning of courage, and the indelible power of friendship, all told through the historic adventures of one extraordinary bear. Lindsay Mattick, Harry Colebourn's great-granddaughter, is the vice-president of an award-winning public relations firm. Based in Toronto, she has shared Harry and Winnie's story around the world. Joshua Greenhut is a consultant and writer. He lives in Toronto with his family. Sophie Blackall is the illustrator of many acclaimed picture books, including Finding Winnie and Hello Lighthouse as well as a number of beloved novels, including the series Ivy and Bean and The Witches of Benevento. She lives in Brooklyn, New York.